Our monitoring is performed with a frequency of 60 seconds, 24 hours, 365 days a year. This way you will be the first to know against any incidence. We have an easy and intuitive control panel where you can quickly find incidents that Pingrely detects. You ’ll be notified about performance problems or downtime with mechanisms of alerts that support SMS, Email, Slack and more. We carry out checkups from all continents using a distributed control system in order to minimize false positives. 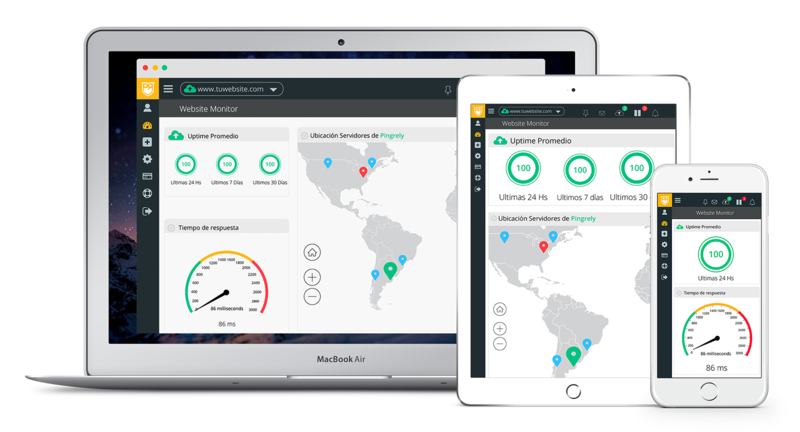 Pingrely has monitoring servers in all continents that allow testing your Websites & Servers with a frequency of 1 minute, 365 days a year, from all over the world where you are. This monitoring is done with a double-check to filter out false positives. In this way you'll be the first to know about any incidence, being able to work on the problem as soon as possible. You will be notified of performance problems or downtime of your Websites with alert mechanisms that support Email, SMS and more. Our alerts can also be integrated with external platforms as Slack, Pagerduty, HipChat among others. This way you'll be the first to know about any incidence, being able to work on the problem as soon as possible. Our system will notify you again when the service gets normalized. We are proud of the new partnership achieved with LiveChat, by which all its users can integrate our service through its control panel. From now on they can have all the information of their website status and its performance, receiving a notification every time it’s down, and all this from their same LiveChat account.